My first thought was that Jake's handwriting was quite legible. My second thought was how strange Jake must be. I probably had those in the wrong order. Hey! Are you in college? Does your college have a newspaper or other type of print or online publication? 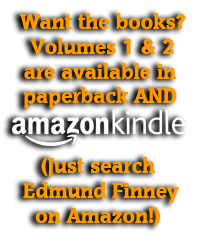 Do you like Edmund Finney’s Quest to Find the Meaning of Life? If you answered “I think so” to any or all of these, how about contacting said paper or publication to request this comic as part of it? I’m very easy to get a hold of and will respond to any requests within 24 hours with details. Just paste this handy little URL into the e-mail and send it to the editor! Also, if you’d like to contact me that’s swell also. My communication is not exclusive to editors. But I don’t talk to hyenas. Those things scare me. Seriously. If you are a hyena you’re scary, and if you are human and have a pet hyena, I’m sure you’re great and all, but I’m afraid your pet might attack me through the phone. Hyenas and parrots that hiss. Pretty much my two animal fears.